Happy St. Patrick’s Day! 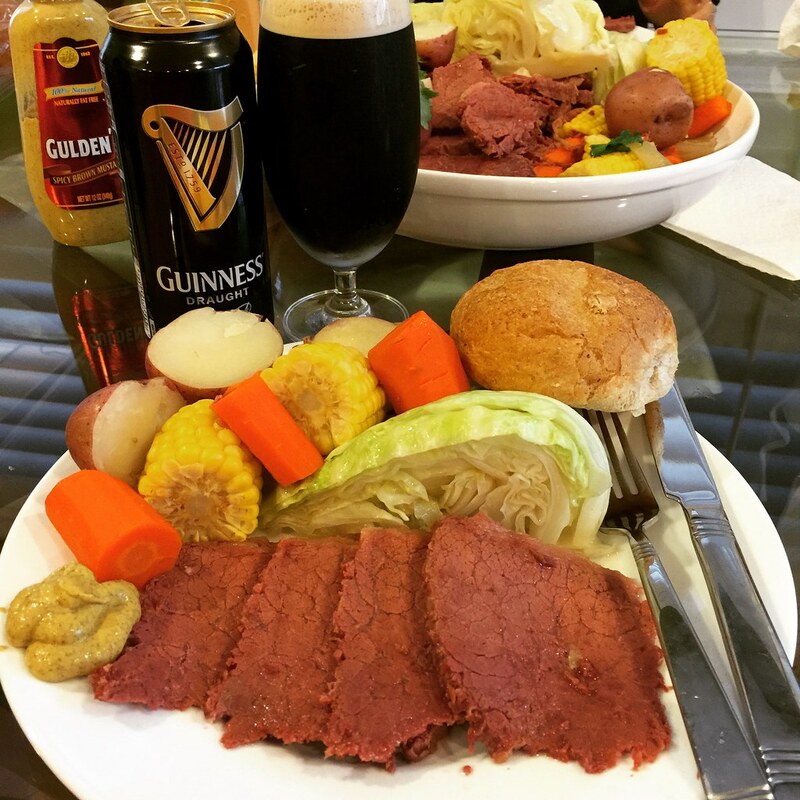 My family has been eating Corned Beef and Cabbage wayyy before I even knew this was a traditional Irish dish. When we moved to San Jose in 1993, we lived with Uncle 3 and his family for a few years. My Aunt 3 made this quite often and easily fed everyone living at the house. As a kid, I always incorrectly called this ‘Corn Beef’ and was super confused why it was called ‘Corn Beef’ when there wasn’t any corn in it. I was about 10 at the time. I later learned that the ‘Corned’ in the Corned Beef refers to the large grains of salt called “corns” that are used in the salt-cured brining process that gives it the name Corned Beef. This recipe is a simple one pot recipe that will feed many people. It just requires a few hours of low and slow cooking to make all the meat and veggies tender and delicious. Leftovers are great for sandwiches, corned beef hash, tacos, or simply eaten with white rice. Remove Corned Beef from package. Wash, pat dry, and place into a large pot. Add onions and seasoning packet into a large pot. Fill pot with 12 quarts of water. Bring to a rolling boil. Reduce heat to medium low, cover pot with a lid, and simmer for about 3 hours. While meat is simmering, prepare the vegetables. After about 3 hours, remove lid and remove the onions from the pot. Discard the onions. Add carrots, red potatoes, and corn to the pot and simmer for 30 minutes. Remove the Corned Beef and cover the beef with foil to rest for 15 minutes. Add quartered cabbage wedges and cook for an additional 10-15 minutes. Slice Corned Beef against the grain in 1/2 inch thick slices. 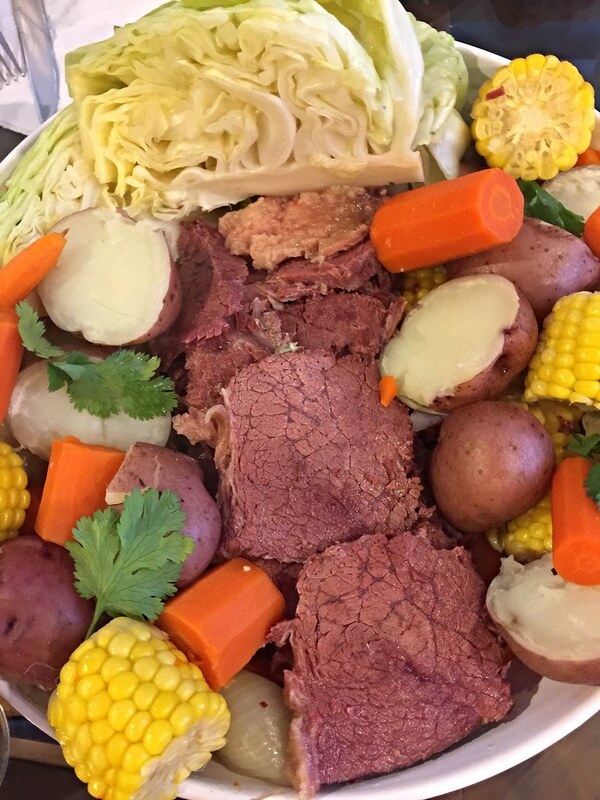 Add Corned Beef and veggies to a big serving platter and serve family style. Corned Beef is pretty salty because of the salt-cured brine. Make sure to rinse thoroughly to remove excess salt before placing in the pot. There are two types of Corned Beef I’ve seen at the stores: Brisket or Round. Brisket is much fattier than round, but both types are still very tender when cooked. My favorite condiment to dip Corned Beef is Gulden’s Spicy Brown Mustard. The spicy and tart flavor of the mustard balance out the saltiness of the meat.